The pomegranate plant is a type of deciduous shrub (or small tree) that is native to areas of India. It belongs to the Lythraceae family of plants and thrives in warm, sunny climes. You can get plenty of pomegranate seeds from just one pomegranate fruit–each piece of fruit contains dozens of viable seeds just waiting to be cultivated. For best results when attempting to grow pomegranate plants from seeds, start with potted plants indoors and eventually transplant the developing plants outdoors. Let your seeds sit out and dry for several days (if they’ve been taken directly from ripe pomegranate fruit) before planting them. If you plant them immediately without drying, less will germinate. Plant the pomegranate seeds in potting soil-filled pots, placing the seeds about 1/2 inch under the soil, and leaving about 2 inches between seeds. Standard potting soil can be used, but it’s even better to add in about 1 part of cactus planting soil to every 3 parts of normal potting soil. 3 Place the pots in a warm area that receives lots of sunshine and water liberally until the soil is fully moist but not soaking wet. Wait for the pomegranate seeds to germinate and sprout. 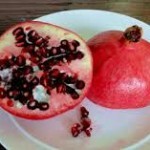 If your pomegranate seeds are viable then it should take no longer than 2 weeks. Thin out the Pomegranate seedlings by clipping off the least healthy looking and shortest sprouts at ground level after they reach several inches of height. They should reach this height about 2 weeks or so after germination occurs. Let the pomegranate plants grow indoors until they reach at least 2 feet high. The amount of time that it takes your pomegranate plants to reach this height is dependent on the growing conditions, but most healthy plants should reach 2 feet within 2 months after germination. After this time you can either continue growing them indoors by repotting them into larger pots or you can transplant them outdoors. Remember, whether you’re growing your pomegranate plants indoors or outdoors, they need warm temperatures and lots of sunlight to flourish. Outdoors you can probably grow pomegranate plants in USDA zones 7 to 10, but the fruit will be best and the plants will grow fastest in warmer climates.